In order to make your own restaurant app quickly and cost-efficient, you need to download our react native food delivery app template. Once you buy the source code, you’ll want to be able to run it on your devices. To do that, we’ve created this detailed tutorial that’s describing how to make your own food delivery app and how to launch it to Apple Store and Google Play Store. Feel free to skip the sections that are not relevant to you. 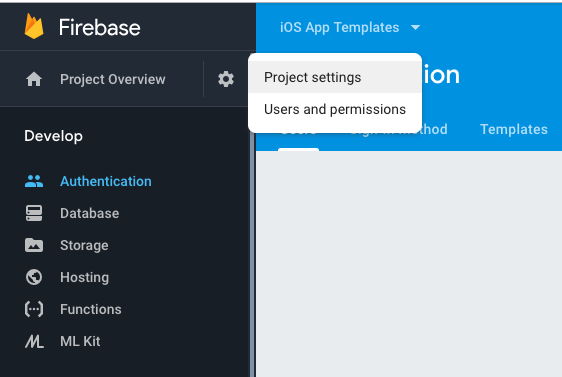 Head over to Firebase Console and create a new project, by clicking “Add Project”. Type in the desired name and add your project. Make sure you are logged in first. You can do this in the Firebase Console, after selecting your newly created project. Please make sure you enable Facebook in the Sign In methods tab of Firebase Auth console. Head over to Project Settings, which can be found on the sidebar menu, under the Settings icon (pictured below). for iOS, GoogleService-Info.plist. Download this file and replace it with the one existing at path_to_downloaded_template/ios/RestaurantApp/GoogleService-Info.plist. 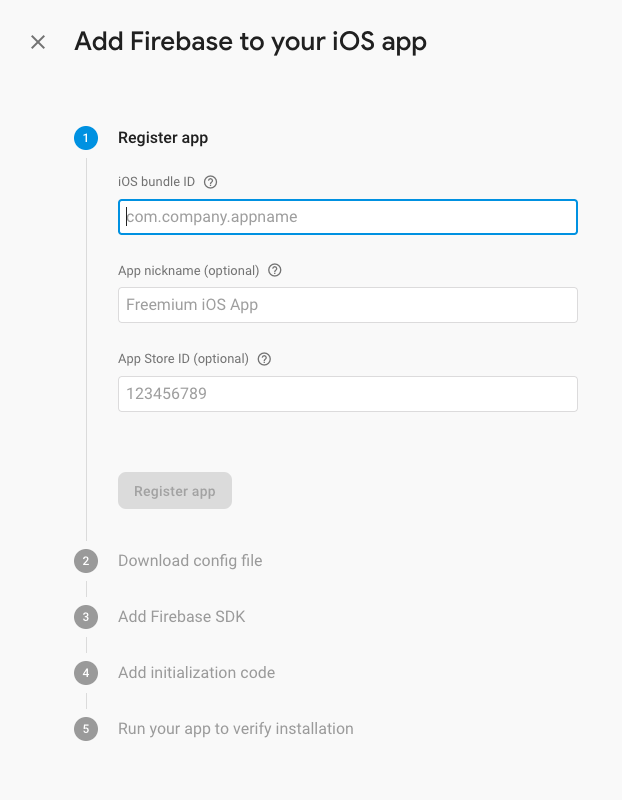 This is step is necessary to give access to your restaurant app to the Firebase Database. The collections for reservations and orders will be automatically created as you add orders and reservations via the mobile app. Once you play around with the real app, you can come back to Firestore and check out the orders and reservations that were created within the food delivery app. This is where you find all the data from your customers. Create a “restaurants” collection, containing one single document that encapsulates the address, name and cover photo of your restaurant. This information is being used on the Reservations screen. Make sure you are using the exact field names. This will work only if you already installed Node.js in the past. If not, you have to install it first, by following the steps listed on the official npm website. If you don’t have Xcode installed on your machine, please download it first. Xcode is the IDE that’s facilitating iOS development. If you haven’t done this already, please refer to the first section, step 4. 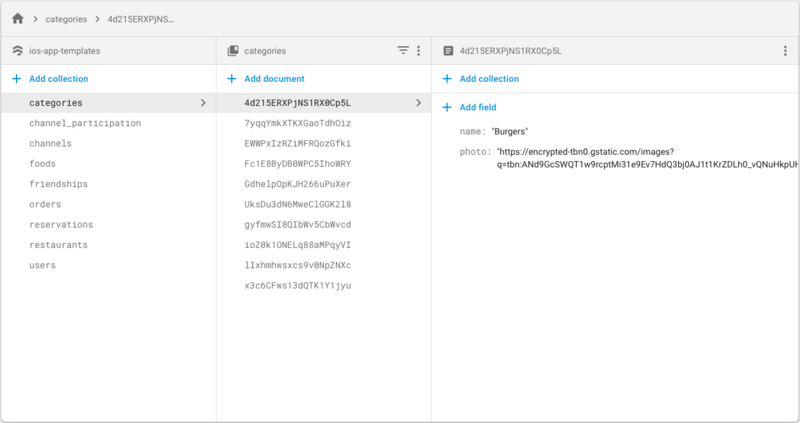 These files are giving you access to the Firebase Database, so it’s critical to do this if you want the app to show your own products, rather than our examples. You’ll need to make a couple of changes, in order to have your users log into your own Facebook app. First, you’ll need to create an iOS Facebook app on the Facebook Developers portal, if you don’t have one already. Locate the ios/RestaurantApp/Info.plist file and open it in a text editor. Update the part related to Facebook configuration, provided by the Facebook guide with your own details. Facebook will ask you for a Bundle Identifier – just use “org.reactjs.native.example.RestaurantApp“. 7. 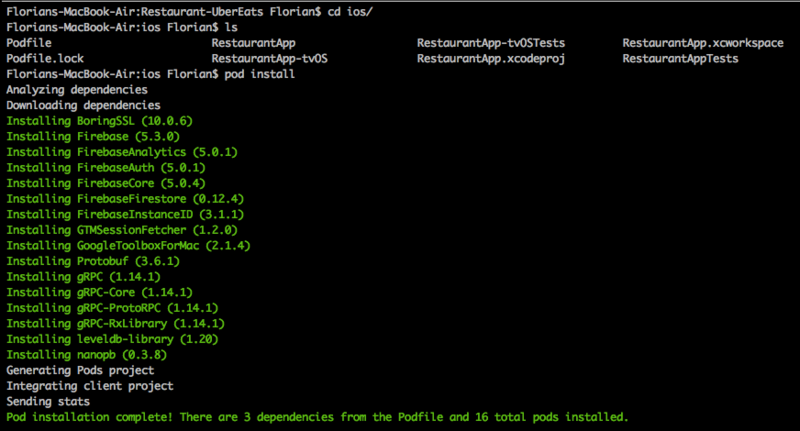 Build & Run the iOS Restaurant app by clicking Product -> Run (or Command + R) in Xcode. Make sure you’re choosing which device you want to run the app in the top menu bar. You can choose any installed iOS simulator or a plugged-in iPhone or iPad. If you need more details on how the iOS development process in Xcode works in general, check out Apple’s documentation. At this point, you’re supposed to have a running instance of the restaurant app, that’s displaying data from our sample Firestore Database or from your own database if you did step 5. Follow Apple’s guidelines on how to submit our iOS food delivery app to App Store. As a protip, make sure you’re using great screenshots and great descriptions, to optimize for app installs. The easiest way to start an Android Emulator is to take advantage of the functionality built-in Android Studio. Download Android Studio, open it and go to Tools -> AVD Manager. Here, you can choose what Virtual Device you want to open. Start it by tapping on the “Play” button. If you don’t want to deal with Android Studio and virtual devices, and you already have a physical Android device, just plug it in and accept the requested permissions. 4. Replace the Firebase configuration file in android/app/google-service.json. You’ve probably done this in the Firebase section above (step 4). Open the file located at android/app/src/main/res/values/strings.xml and replace the facebook_app_id with your own id. For this, you’ll need to create an Android app in the Facebook Developers portal. Check out this quick overview detailing how you can achieve that. You’ll be using “com.restaurantapp” as the Package Name and “com.restaurantapp.MainActivity” as the Default Activity Class Name. That’s it. This should be starting the app in the emulator or the physical device that’s plugged in. You should be able to see all the categories and food items added in the first section, as well as creating orders and restaurant reservations. Check out the Firestore Database to see the new orders & categories that your customers are making. Follow Google’s instructions to submit your Android app to the Play Store, by using the Play Console tool. Please don’t hesitate to contact us if there’s anything we might have missed in this React Native tutorial. 3. Facebook Login doesn’t work. First, make sure you enabled Facebook auth method in the Firebase Auth Console. Unless you explicitly specify this auth method is allowed, the Facebook Login button in your app won’t work. If you’ve already done that, double check you updated the configuration files properly, with our correct Facebook app details.